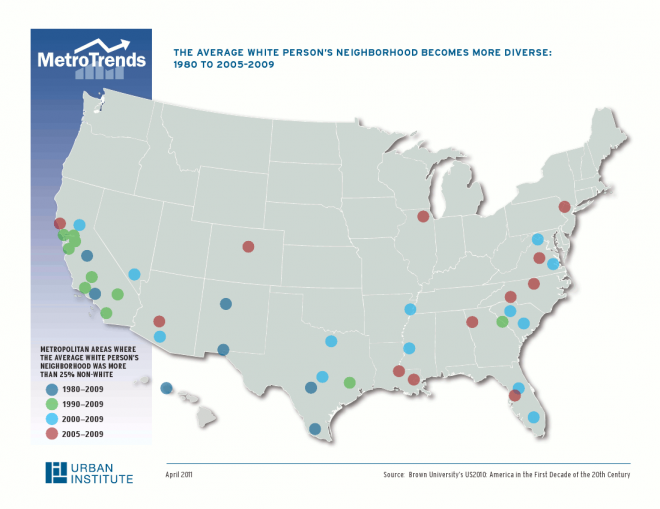 Over the last three decades, US metro areas have become dramatically more diverse, and neighborhood segregation has slowly declined. In 1980, in only 7 big metros was the average white person's neighborhood more than a quarter minority. These mixed-race metros were mostly on the west coast and near the Mexican border. Today, 41 of the top 100 metros -- some in the south and midwest --have neighborhoods this diverse, with at least 25 percent people of color living in the average white's neighborhood.